Since the 1970’s Yoshimura has been one of the best known names in motorcycle racing. Their philosophy is racing and winning. They view racing as the harshest environment to develop and test their products and at the heart of that development is their R&D department. The R&D guys at Yoshimura are self described gear heads with a single mission: make the best parts possible, and never compromise. They have their own building with the best tools to make just about anything. 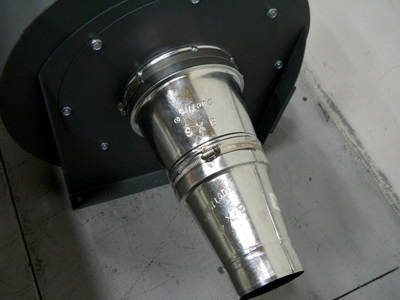 When these guys started looking for a carbon fiber cutter, we were floored at the opportunity to build a plotter/cutter that would help design and manufacture the newest, best exhaust systems in the world. Talking to their carbon fiber specialist, Mike Biere, about their current and future plans for in-house carbon cutting, we decided to produce a new industrial version of our Pro model PT-72, called the PTi. The PTi would have more power, a stiffer frame, and a larger and more rigid cutter. This robust model would ensure they could keep up with their growing demand for carbon fiber parts. Two good looking models!! The PTi side-by-side the PT. 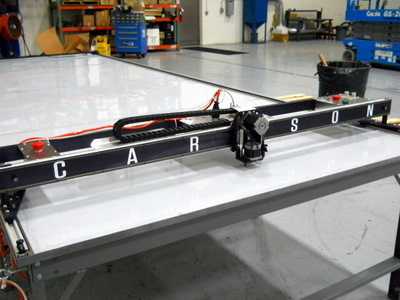 Note the PTi's taller frame rail, custom load reducing drive plates, larger Y and Z motor, and custom drive belt. Before we tell the story of the PTi install, let’s skip to the end with a quick glamour shot — pretty awesome right? 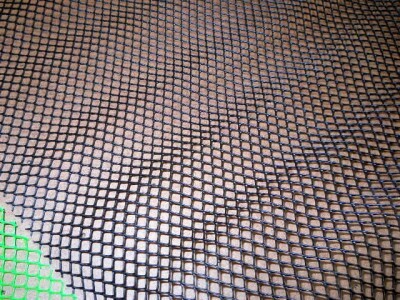 Sample material -- carbon Fiber and Kevlar weave -- really hard to cut by hand. 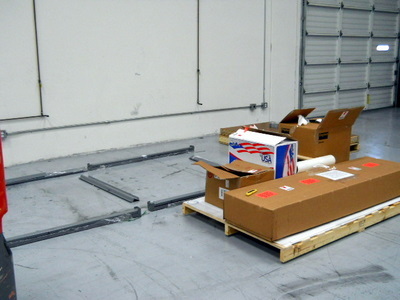 Now on to the install — the table and cutter arrive separately. Setting up the plotter/cutter takes an entire work day. Laying out the table frame before assembly will make the process go a lot quicker. The table uses one size nut and bolt throughout, so if the parts are in the right place screwing it together is very easy. Once assembled, leave all of your nuts finger-tight. Position the table where you want it and then insert the vacuum tops. 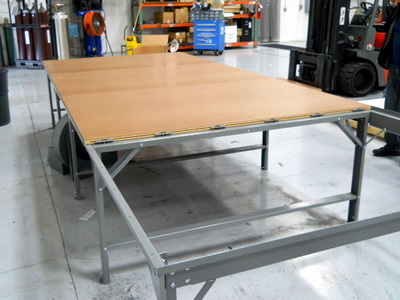 Manually adjust the table so legs and tops are visually square. A magnetic level is great for quickly squaring the frame. 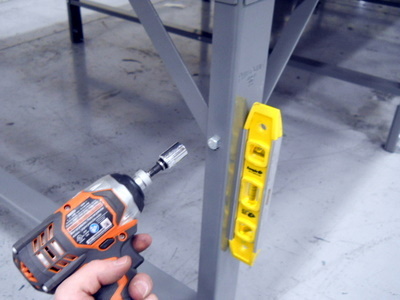 All the nuts are self locking, so you can tighten the bolts quickly using a drill or impact driver with a 1/2" socket. This is also good Nascar pit crew practice. 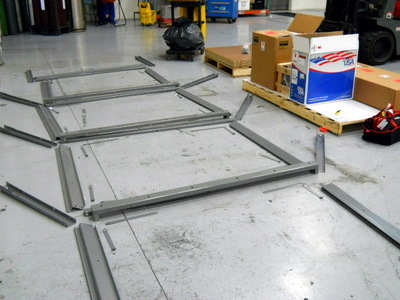 Once the frame is level and square, mount the track. 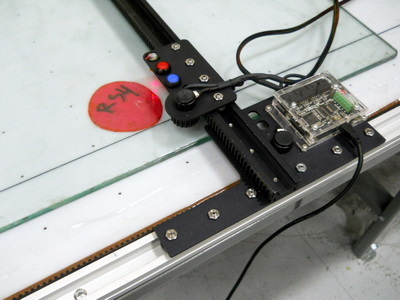 Attach one side and then use the plotter/cutter to square the other side, securing as you go. Clear away any debris, wipe down the track and belt with acetone and attach the track belt to the metal rails. 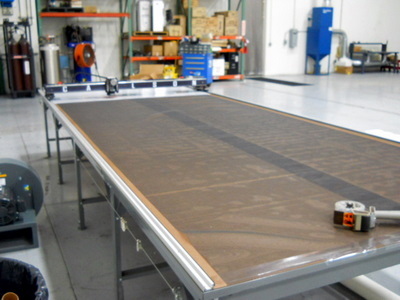 Use a vacuum breather between the table top and cutting surface to create an air channel. Thicker, woven mesh is best. This is molded window screen. Following a tip from one of our customers, we replaced the window screen with this dish drying mesh used by restaurants and bars. The thicker weave made a big difference. You could even hear a significant improvement in airflow. Woosh! Attach the plumbing. 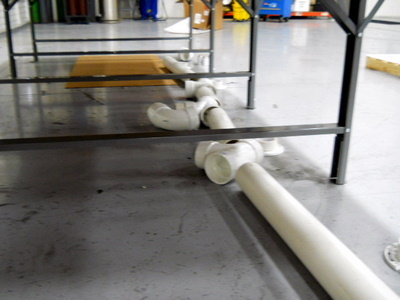 Securing carbon fiber during cutting requires a lot of vacuum, so you must use rigid pvc. 5HP radial vacuum blower with 8" to 4" reducer. Securing your carbon fiber prepreg during cutting is a big deal. This can be a difficult for several reasons. First, your prepreg has been rolled up in a freezer and while it’s still cold it does not want to lay very flat. Next, thicker prepreg is a sticky, hard to cut material, which means you need to put a good amount of pressure on your drag blade to get a complete cut. This pressure can drag your prepreg if not properly secured. Finally, carbon is expensive, so you will try to nest parts as close together as possible to ensure maximum material yield. You will lose material hold as you make more and more cuts — if you vacuum is undersized, this can cause tightly nested parts to shift or drag. For thinner carbon fiber K3, fiberglass breather, and very sticky prepreg we were able to use a single 5HP radial vacuum blower (pictured above). Unfortunately the heavier carbon fiber prepreg k12 had a tendency to shift. 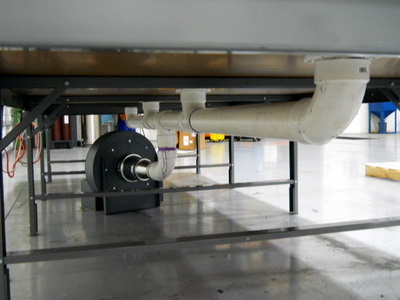 To resolve, we replaced their single 5HP radial blower with two 4.5HP regenerative blowers. These are lower volume, but have 7X the pressure. They did the trick, allowing for tight nesting without any material shift. If large vacuum blowers are not available, 3M makes a reusable semi-adhesive tacky spray you can use to glue your material down during cutting. Once setup, attach your cabling. In large open factories overhead cabling might not be practical. 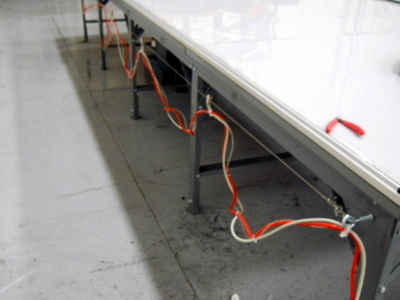 Using 4" eye bolts we mounted their cable off one side of the table. 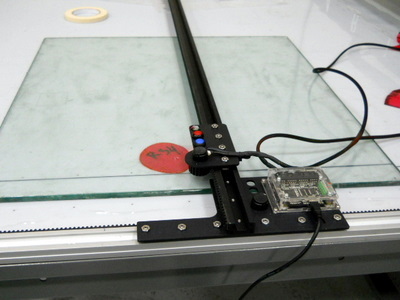 Securely tape your cutting surface to the table top. They are using 1/16" polyethylene with a3"x3" hole pattern. Be sure to cut your cutting surface 4" narrower than your table width. 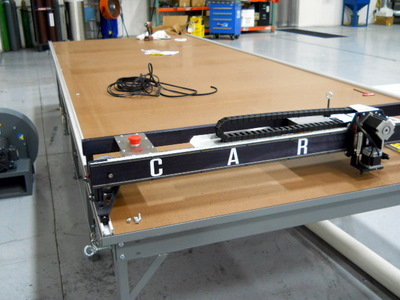 Your plotter/cutter and vacuum table are now ready to use! It’s time to setup your software. The new 2012 Plotmaster USB software — PMU — will run on any Windows PC. We can provide a Windows7 PC, preloaded and tested or you can provide your own. If you use your own computer, we recommend making it a dedicated machine — this means leave Itunes and AOL at home! We also recommend you connect your PMU computer to the internet for the latest updates, purchasing consumables online, virtual help and training sessions, and checking out blogs like this one. We provided Yoshimura with a preloaded and test Windows 7 PC. 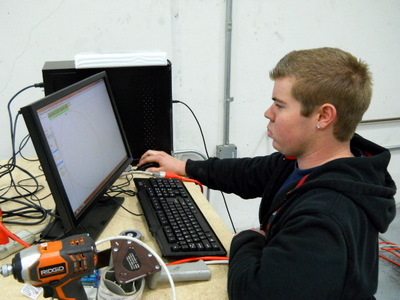 They provided the monitor and have plans to build a more formal workstation. For now the table behind the cutter will work. 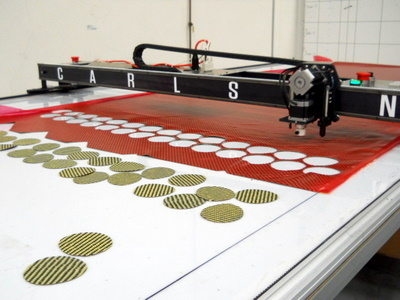 You can draw patterns using almost any CAD program or manually create patterns using our T-Bar Digitizer. The T-Bar is ideal for tracing existing patterns or manual prototyping where unusual shapes might be very difficult to draw on the computer. Yoshimura’s R&D department has CAD designers and a T-Bar. 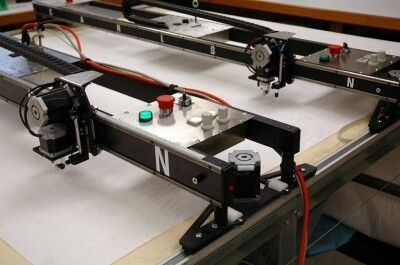 The T-Bar lets the plotter/cutter operator, Dustin, digitize jobs without any assistance from the CAD draftsmen. They also had a large collection of physical patterns that are now stored digitally. The T-Bar is setup to digitize one of their more popular muffler tips. This shape looks like a circle, but it's not. The T-Bar makes sure they get an exact match. 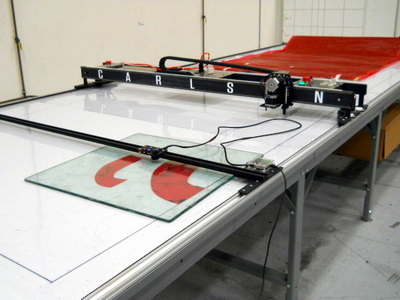 The T-Bar can digitize patterns as wide and as long as the plotter's table. A piece of glass or clear plastic is great for securing small patterns during digitizing. The T-Bar is powered by USB and easily slides off the table when not in use. T-Bar and Plotter/Cutter. The Tbar will digitize plot and cut lines. You can also digitize multiple patterns in a single session. One more look at that PT! With the cutter in-house, Yoshimura R&D is now setup to cut hundreds of sets a muffler parts each week. They can also prototype new styles, new carbon fiber types like the yellow kevlar weave featured above, and test cut lots of other parts they may want to start making out of carbon fiber. 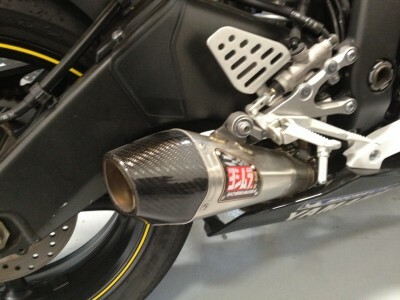 Big thanks to Mike, Dustin, and the rest of the Yoshimura team for making this a great install. We look forward to seeing what incredible carbon fiber motorcycle parts you all produce in the coming years.